Welshappletrees.com Welsh Apple Trees, specialist mail order fruit tree nursery. 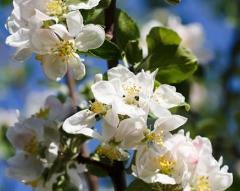 Growers of Welsh, rare and heritage apple trees. We try to describe all of our products clearly and honestly, there are always slight natural variations in shape and size. Any photos and descriptions are representative. All sales are on the basis of full payment being received before delivery. All fruit trees are zero rated for VAT purposes, where other items do include VAT the price quoted will be inclusive of VAT. It is important that your address information is accurate, we use reputable couriers and aim to deliver within the timeframe specified but cannot be held responsible for factors beyond our control such as poor weather conditions. All of our trees are lifted to order and we avoid lifting during heavy frosts, we will keep you informed if an order is to be delayed. All of our trees are in good health and condition and are well packaged. Please contact us immediately if there is any damage to a tree when it arrives, we may require a photograph in order for us to recover any costs from the courier. You must contact us within 3 days of receiving a damaged tree in order to receive a refund or replacement. In the unlikely event that you are sent the wrong item the same applies, we will then arrange a refund or replacement. All of our trees are sent out in good health, the ongoing health of the tree depends on a great many factors of which we have no control over. However if you have a problem with your tree within the first year since its purchase we will endeavour to offer some help and advice with regard to your tree's health. It is very important to us that all of our customers are happy and we will do our absolute best to find a solution to any issues. If you change your mind and decide to return your order to us we will accept it back on the basis that it is in its original condition and packaging. In these situations the buyer will have to pay for returning the tree to us. We do not store credit card details nor do we share customer details with any third parties. Payments will be handled using the Paypal secure payment system.